Welcome to the Greene King Essex Veterans Football League Website. The League was founded in 1993 as a sub-section of the Mid-Essex League, before becoming an independent League in 2002. During the 2018/19 season the League has 86 teams playing in nine Divisions, with the minimum age of players being 35. 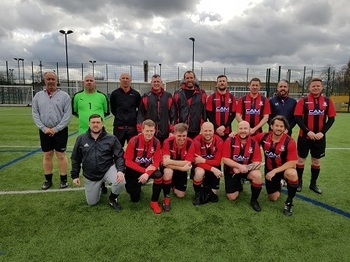 We are also running an three Over 45 Divisions with a total of 30 teams, which makes us the largest Saturday League in Essex. The League covers from Southend in the South East of the County, right along to Walthamstow, up the M11 corridor to Newport, across to Silver End and then down to Tillingham. Sportsmanship and hospitality are a key element of the competition. The David Thrift trophy is presented each year to the team with a combination of the best sportsmanship marks and fewest cautions from referees. The Noticeboard has details of Clubs looking for players and/or friendlies. Website last updated 19th April 2019 League Honours updated. Just a reminder applications for new Clubs wishing to join the League in season 2019/20 close on 18th April 2019 . If you require further information or an application form please contact the League Secretary on martinberry@blueyonder.co.uk. For existing sides if you are looking at running a different number of teams next season, or teams in different age groups please can you let the League Secretary know by 24th April please? Sin Bin’s have been made mandatory by the FA for season 2019/20. The Essex FA have arranged training sessions across the County over the coming months. All Referees have to attend one of these sessions so they know how to operate the system. All teams are also encouraged to send representatives so they are aware how the Sin Bin’s work.